In recent years, we've sometimes made chili on the colder New Year's Days, and this year we decided to start a tradition, so we've invited friends over for a chili potluck. We've accumulated a number of recipes over the years -- that's one of the great things about chili, that there are so many different versions, and so many things to like about each one. I usually don't serve the kids something different from the grown-ups, but in the case of today's chili, I'm happy to make an exception. I figured that Sloppy Joes look kind of like chili, so it's a reasonable alternative. I often tone down the chili that I make, so that it's not "too spicy," and this way I get to kick it up for the adults for a change. This chili is based on "Ryan's Revenge" from an old Parade magazine (of 28 September 2000). I'm no expert, of course, but I think that chili-making is kind of a seat-of-your-pants thing, in that if you haven't got enough (or any) of one of the ingredients, it's perfectly fine to substitute, lessen, or even leave it out. I like things spicy, but not blistering, so I reduced the original amount of chili powder from 5 1/2 tablespoons to 3, and likewise tinkered with other ingredients, but I also improvise on the spot. 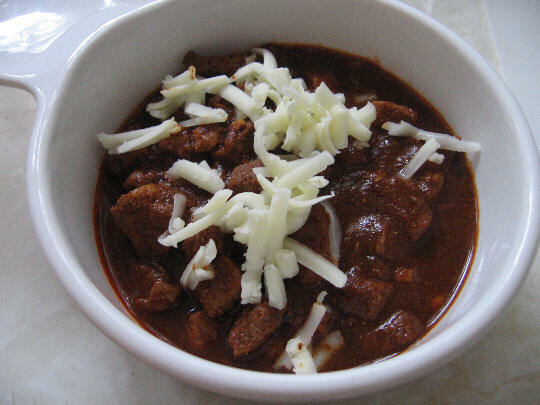 Taste your chili after an hour or so of simmering, and if it's too hot, add some more tomato paste, a pat of butter, more mole (if yours isn't very spicy), or perhaps a can of beans to cut down the heat, and if it's not hot enough, well, add some more of any or all of the spices! Mole ("mo-leh") is a spicy sauce accented with chocolate that is often used in Mexican cooking, especially over enchiladas or "wet" burritos. There are as many different kinds as there are Mexican cooks, so if you can't find one that is specifically poblano, use any kind -- the chocolate is the key, as it gives a wonderful base note to the chili. Combine the beer, chili powder, cumin, paprika, bouillon, and oregano in a large, heavy pot. Add 1 1/4 cups of water, and bring to a boil, then remove from the heat. Melt the olive oil and butter in a large skillet over medium heat. Brown the meat in batches, and season with salt and pepper if you want. Transfer the meat to the pot with a slotted spoon. Sauté the onions, pepper, and garlic over low heat, adding more oil if necessary, until softened, about 8 minutes, and transfer to the pot. Stir in the tomato paste, coriander, mole, and sugar. Bring to a boil, then reduce heat and simmer, covered, for 2 hours. Serve with a lime wedge to squeeze over the chili, and the cheese, as you like. Makes 8 servings. Preparation time, about 1 hour; total time, 3 hours.